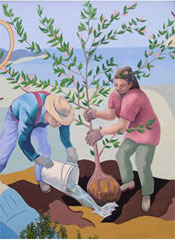 The Artist in Residence (AIR) Program at Recology San Francisco shows work from a one-of-a-kind program started in 1990 to encourage people to conserve natural resources and instill in children and adults an increased appreciation for the environment as well as art. Applications are accepted only from Bay Area artists to keep it local, and six finalists are selected annually. Residency artists have 24-hour access to waste materials at the company's 46-acre site, which includes the transfer station, public dump, several recycling facilities, and a large well-equipped studio in which to create art from refuse that would otherwise go to landfills across the Bay or recycling plants across the nation. 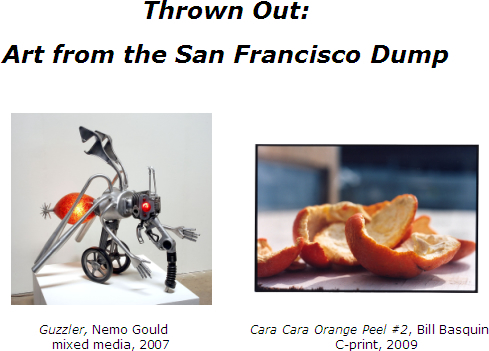 Co-curated by Deborah Munk, Director of AIR, and Sharon Spain, Program Coordinator, Thrown Out: Art from the San Francisco Dump presents work by past and present artists in residence who have created treasures from trash. A case in point: Nemo Gould (AIR 2007) creates wonderfully surreal yet endearing creatures and contraptions from found objects, such as his Guzzler (2007), made from engine parts, a gas pump, baseball bats, ten-speed bike handlebars, vacuum parts, a lamp, extension ladder parts, a garden soil aerator, and golf caddy cart wheels. This may sound like a lot of junk thrown together, but the resulting piece has a singular integrity, presence, and polish. Guzzler feels like a creature but looks like a machine; and, of course, it reminds us of our oil fixation. Bill Basquin (AIR 2009) takes a different tack. His work includes 16 mm films about rural life and farming; one of his films, Range, was shown at Sundance Festival. His vision is to integrate the rural into an urban setting. He explores the subject of raising food in the city through photographs and mixed media works, such as an installation piece that invites viewers to become one with the soil through the experience of sitting inside a dark, closed compost box. Still photographs continue the themes of food and simple living, such as the C-print Cara Cara Orange Peel #2, framed in reclaimed wood, that Basquin created during his 2009 residency. Read more about the AIR program at www.sunsetscavenger.com/AIR. Deborah Munk will give a Curator’s Talk on the closing day of the exhibition, Sunday, March 28, at 4 p.m. The lecture is free to the public.